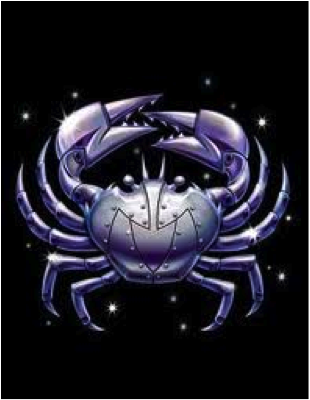 Cancer is the fourth astrological sign in the zodiac which spans between 90th and 119th degree of the celestial longitude. In the tropical zodiac, the Sun transits this area of the zodiac from June 22 to July 22 and under the sidereal zodiac, it is currently from July 21 to August 9. 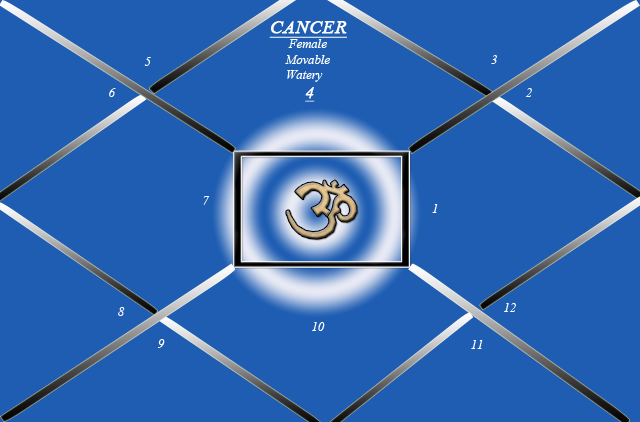 Individuals born during these dates, depending on which system of astrology they subscribe to, may be called Cancerians. A crab is able to walk or run sideways. Similarly, Cancer natives can sometimes “move about” in life, in a figurative sense or in an indirect manner. The crab’s body is covered by a carapace (shell). (2) Cancer natives tend to try to blend in with their environments, preferring not to make a big splash in life. Characteristics of Zodiac sign- Cancer. • Cancer represents the motherly feeling in an individual. So all qualities of mother which we can imagine are seen in a Cancerian. • Cancer is a female, movable and watery sign. • Being a female sign, we see people dominated by sensitivity, affection, tolerance, dreamy, dependant, compromising, sympathetic with lack of ambition and forgiving ability. • Being movable, they love travelling and admire nature.They love changes, are inconstant, indecisive and are not firm about their opinions. • Being watery, they become very adaptable in nature – always compromising and can adjust to any situation. • Usually are very affectionate, sensitive and will get offended very fast but cool down quickly. • Emotions and sensitivity are their main characteristics. • Being a rashi of Moksha Trikone, they are spiritually inclined. Can go deep into trans during deep meditation. They are fully dedicated to their responsibilities and can completely surrender to God or a person. Due to this, they are most susceptible to disappointments. • Lord of Cancer is Moon, which rules the mind of person. As moon Waxes and Wanes, the same way the person can go from exhilaration to depression very quickly. Moon dominates the emotions of person, causing them emotional anguish and at the same time making them very affectionate and caring. Such people can be very poetic. • Cancer rules over chest, breasts, fluids, emotions and alveoli. In a chart, whose ascendant is Cancer or Moon is in Cancer or Taurus where moon is exalted/strong, they will have the above characteristics predominant in his/her personality.